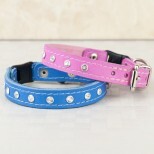 At Aristopaws we are aware how important it is to purchase the correct type of collar for your breed of dog. These sighthound collars have been specifically designed so that they measure 1 1/2" at the widest part and taper to a half inch buckle for the smaller collars. Larger collars measure 2" at the widest part tapering to a 1" buckle. This is to protect their delicate necks and prevent them from escaping their collars. 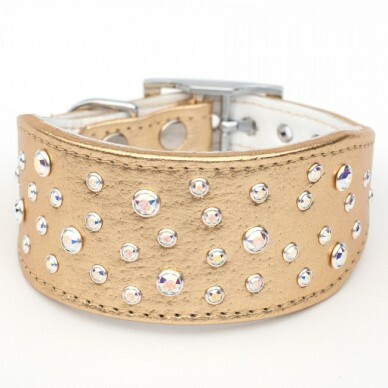 Made from luxurious gold leather and lined with contrasting soft white leather which will prevent rubbing associated with other firmer collars. Each collar is custom made to order to ensure that perfect fit and is adorned with a combination of dazzling Clear and Aurole Boreale Swarovski Crystals, which will make your Italian Greyhound / Whippet / Greyhound stand out from the crowd and look like royalty. The best way to measure your sighthound for a collar is to have your dog stand and measure the circumference of their neck just behind the ears with a tape measure. Tighten the tape measure enough that it sets against the fur but is not constricting the neck. Take the measurement and use to select the most appropriate collar size. 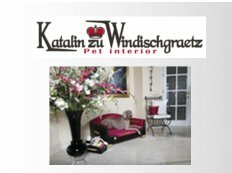 Once you are satisifed that you have chosen the correct size and decided on the leather that you require just enter your options in the drop down menu above. 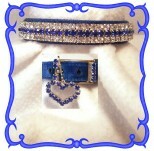 Please allow 5-7 days for delivery as each collar is custom made to order.